Every year, millions of people get sick with the flu, despite the fact that many of them had a flu shot. This may be explained by this: flu shots containing only 3 or 4 variants of the flu, but people are hoping that they will gain protection against the thousands of possible flu variants. Personally, I do not believe that ubiquitous flu vaccination is effective therefore I choose to opt out of flu shots. 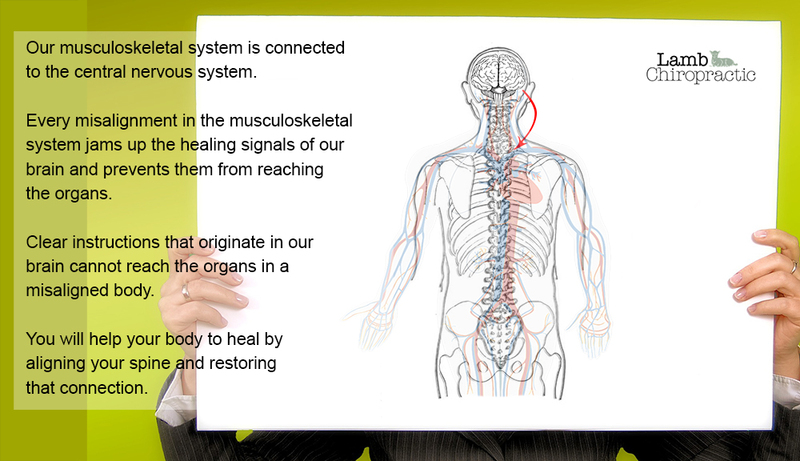 Our musculoskeletal system is connected to the central nervous system. Every misalignment in the musculoskeletal system jams up the healing signals of our brain and prevents them from reaching the organs. Clear instructions that originate in our brain cannot reach the organs in a misaligned body. You will help your body to heal by aligning your spine and restoring that connection. Most people would agree that the central nervous system is the control center of our bodies. I think most people look at the immune system as if it is just reacting to foreign bodies, but I tend to believe that it is much more than this. I believe there is a dynamic relationship between the nervous system and the immune system. The fields of psychoneuroimmunology and psychoneuroendocrinology show that there is great interest into the study of these complicated connections. Since chiropractic aims to enable full expression of the central nervous system and the nervous system has a very important effect on the immune system, it seems to me that if your immune system needs a boost, besides loading up on your antioxidants, fat soluble vitamins like D, Echinacea and whatever other herbs that may have a positive effect, GET ADJUSTED! Schedule your appointment with Dr. Lamb today! Great article and great advice. Thank you for posting it. I found this article by looking up treatments for flu. This season’s flu is really terrible. I will definitely schedule an appointment with my chiropractor now. Thank you! previousIs a Chiropractor a 'Real' Doctor?